Great strings, and as this was my first purchase directly from you, I was very pleased with the customer service, especially the very quick delivery and your designating a customer service rep in case I had issues. I'll be back! I have used DAdarrio strings for the longest time. My friend hipped me to John Pearse 700M and I couldn’t be happier. Nice warm tone that gets better with some playing. Crisp attack and sound that fills a room. Stings By Mail places my order right away and I received the strings in a matter of days. Very happy with the experience. Got these Pearse mediums and like them a lot on my D18! Don't know if the difference in tone from the lights to the mediums are enough for me to stay with them, but for now they sound lovely. Service was impeccable and fast. Will be ordering again! Great Strings @ a Great Price! 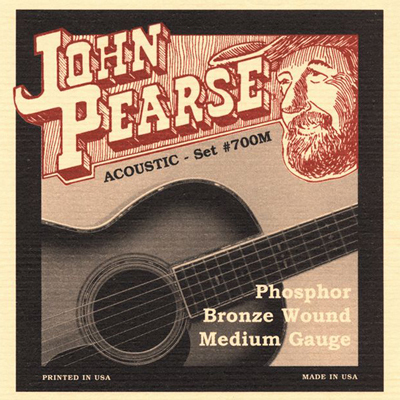 The John Pearse Phosphor Bronze strings were packaged nicely and surised me by how quickly they arrived. Very good experience! A: They are not offered in a multi set but we were able to apply a quantity discount.